We are nearing the end of the filmmaking process, as well as the end of this series. Let's dive into the world of sound design! Sound design, like editing, is a part of filmmaking that you probably don't notice, but has an enormous impact on your viewing of the film. Sound designers go in and use either recordings from the set, go out and record wild sound effects or re-record actors dialogue and piece it all together to provide the audio for the finished product. Everything from footsteps, dialogue, rain, wind, animals, machines, clothing, and more are all given a unique sound for the film to make the story that much more believable. Often, dialogue is used from the on-set performances because these are truest to the emotions the director wants to achieve on set. 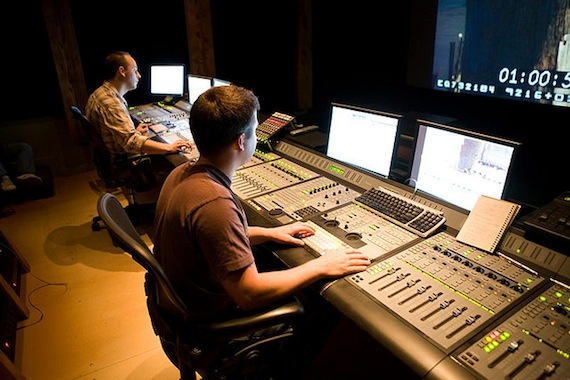 Sometimes, however, due to noise on set or other reasons, up to 90% of the finished dialogue has been re-recorded in the studio in a process called ADR, or Automated Dialogue Replacement (although, it's often anything but automated, requiring large amounts of time). A lot of the sound effects, such as footsteps and clothing, are done using a process called Foley, where "Foley artists" are in a recording studio with a bunch of props and record the sound the props make in time with the edited movie, making sure all the sounds sync up with the film. Some sound effects need a little more creativity, however, as using the real sound of an object may not always sound the best or create the correct emotion in the scene. When this happens, many times the sound designers will record seemingly random sounds, and put them together to make new sounds. You find this a lot in movies like science-fiction films, because who has a spaceship sitting in their backyard? How are the sounds of the movie affecting my experience? Does the emotion of the sound effects match the emotion of the scene? Does it bring out something else entirely? Do you believe the story more because of the sounds? Do you even notice the sounds, or does it just seem like the sounds in the movie were captured on set (even though they probably weren't)? Are there any sounds that aren't realistic, or sound a bit off? Was this intentional? And if so, why might the filmmakers make that choice? Are there any sounds or pieces of dialogue that don't seem to work well? How is the sound mix? Can you hear everything you need to? Or is the dialogue muddied by sounds or music? Was this intentional? For a few of these posts, I've had you turn the audio off. This time, either turn the screen off or close your eyes and just listen to the audio with no visuals on a film you know well. Do you notice anything that you didn't notice before? What stands out? Now watch it with the visuals. How do the sounds work in tandem with what you see? How does it add to what you are seeing? Is it believable? I'd love to hear what you find, so throw your thoughts in the comments!